This summer, PennDOT has been rolling out travel time displays on VMS throughout southwestern Pennsylvania. I started noticing them pop up along the Parkway West in May, and they spread to I-79 shortly thereafter. Tonight, I've noticed they've reached into Washington and Greene counties. One of the more unique things I've noticed is that PennDOT is supplementing their permanent VMS with portable VMS parked along the shoulder. There's one on I-79 SB near the Washington/Allegheny County line displaying the travel time to I-70. There's another new one on I-79 SB near MM 31 south of Washington displaying the travel time to PA 21 (Exit #14). Does anyone know how far PennDOT plans to go with its travel time rollout? 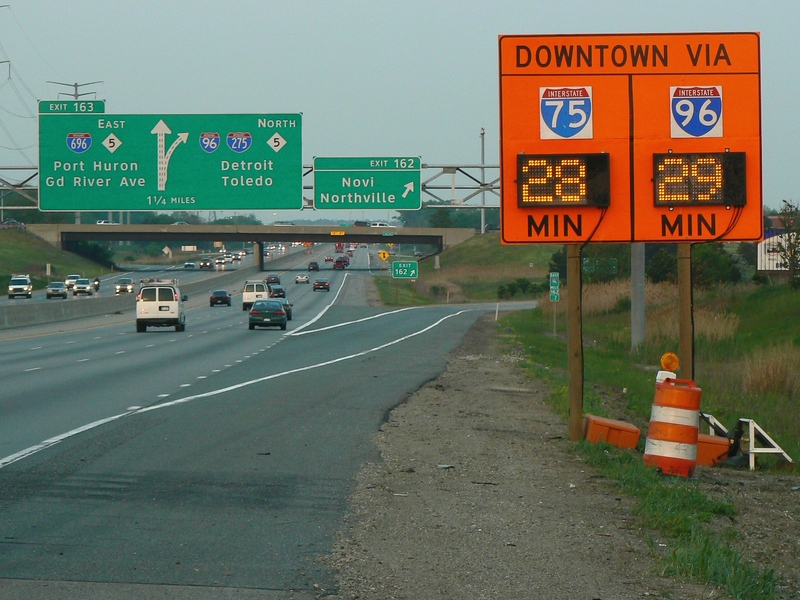 Also, has anyone seen other states use portable VMS for travel time displays before? There's a portable VMS used for travel time info on I-87 SB just before the Twin Bridges. Not sure why it wasn't made a permanent VMS and/or put somewhere else; in the morning rush, you've already passed most of the delays by the time you get to the VMS. I haven’t yet encountered travel times posted on one of PennDOT’s trailer-mounted portable VMS units. But regarding the travel times displays in general: They’re now ubiquitous on VMSes in the Philadelphia area that aren’t displaying a more urgent message. I’ve also seen them around greater Harrisburg, NEPA, and the Lehigh Valley. One installation that I found somewhat interesting was a comparison of travel times to the PA/NJ line via US 22 vs. I-78 just west of the split near Fogelsville. And it would appear that PennDOT plans to roll out travel times displays to nearly every VMS-equipped freeway statewide (if they haven’t been already)—even rural areas. I was surprised to see “TRAVEL TIME TO I-99” posted just west of Danville on I-80. The stretch of I-80 between US 15 and US 220 is almost certainly the most desolate stretch of Interstate in the state. I think I have seen a few in areas where the VMS is being used for other information. (I am thinking maybe on I-81 SB/US 322 WB near the Farm Show when an event is going on there.) The only one I remember seeing consistently is one in the median of I-81 between Linglestown/Paxtonia (Exit 72) and PA 39 (Exit 77). Also I was able to move the thread since it was put in Mid-Atlantic. Also, has anyone seen other states use portable VMS for travel time displays before? Prior to MassDOT's recent implementation of hybrid VMS/BGS' travel time displays; they always used portable VMS' for travel time displays. IMHO, this should be an MUTCD standard since such frees up conventional VMS' to display more immediate or imperative information. Ohio has installed hybrid VMS/BGS displays like that in the last couple years throughout the state. I've seen photos of similar Indiana installs except with a blue background instead of green. I think the hybrid signs work well for installs at decision points where there's a benefit to always have travel time shown, but I don't see anything wrong with using full VMS to display travel time info if they're otherwise dark or just displaying safety slogans. Saw a few on I-80 (both directions) between Tannersville and Delaware Water Gap (Poconos area) during a trip up there last weekend. Near home (northeast of Philly), still seeing mostly permanent VMS displays of travel times unless through work areas. NJ has for construction zones. The portable VMSs and portable doppler radar and/or Bluetooth readers are set up for several miles radiating from the construction zone to provide decently accurate travel times. They also used the equipment to show the "Average Speed" ahead, which was highly inaccurate. If the VMS said "Avg Speed 34 mph", you could be flying along at 65 mph, then suddenly wind up stopped for a moment, then crawling at 15 mph. The signage didn't help in that respect. Yeah...like "Fasten your Seatbelt" and "Put down the Phone and Drive". IDOT and ISTHA post their travel times on the VMSs and alternate them with a message. I have never seen a travel time display on the Ohio Turnpike or on the Indiana Toll Road. They are popping up all over Districts 2/3 across the north central part of the commonwealth. They use them a lot in District 6 (Philly). Only complaint is they are not used constantly, even when there's traffic. An even bigger complaint is when the signs don't warn of major incidents (which happens about half the time it seems). Michigan occasionally uses them with big construction detours. I've seen at least a couple in the downtown Detroit area showing travel times via I-94 and I-96, which are the main detour routes with southbound I-75 closed south of Detroit until December 2018. PennDOT's staged rollout of travel times in southwestern Pennsylvania has been continuing. They now have travel times on I-79 all the way to Exit 1 at Mount Morris, just north of the West Virginia state line. I assume I-70 west of Washington has been getting them as well but haven't been up that way in the past month to check.